There’s been no direct response from the Internet Archive in the month since the NWU and dozens of other organizations launched our campaign against so-called Controlled Digital Lending (CDL). Unauthorized scanning and distribution of digital copies of printed books continues, unchecked. The defenders of CDL have, however, posted their own new FAQ which is obviously intended as a rebuttal to our FAQ on CDL. We take the fact that the authors of the statement and white paper attempting to justify the theory of CDL felt it necessary to issue their own FAQ as an indication that they are feeling the effects of our campaign, and no longer thought that they could ignore their critics entirely. So far as we know, this is the first public response to any of the critiques of CDL. It explicitly defends the distribution of unencrypted images that remain in the browser cache even after the reader clicks on “return”, and explicitly defines this as part of CDL despite the contradictory claim that CDL employs DRM and distributes only encrypted copies with a limited viewing time, which the in-browser viewing mode does not. The recent demonstration of “CDL” by Brewster Kahle of the Internet Archive at the Boston Public Library was conducted entirely using the browser view, not the DRM option. In the same presentation, Kahle said that most viewing and reading of books scanned and distributed on the basis of CDL is in this mode. It asks, “Q: Does digitization cannibalize sales of print books?”, entirely ignoring interference with all of the markets other than book sales (as enumerated in our FAQ on CDL) for works included in printed books. 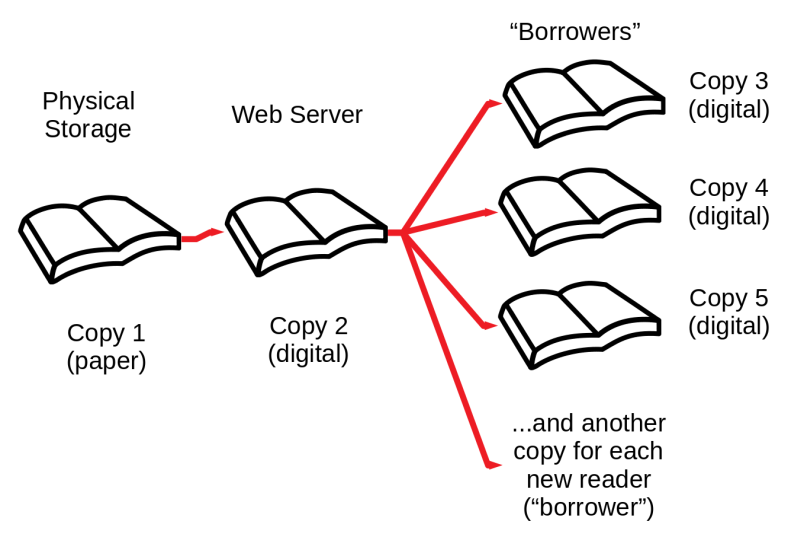 It claims that CDL is intended to give a “new life” to “materials that have not circulated in decades.” But the practitioners of CDL have made no attempt to identify or exclude from scanning works that are already available in digital formats or to enable authors or publishers to indicate to library patrons where they can find these existing digital editions. It asks, “Q: Is CDL intended as a replacement or substitute for existing electronic licensing services offered by publishers?”, but it doesn’t mention any of the digital versions that are being offered or licensed by authors rather than by print publishers. Digital rights to works included in older and out-of-print books typically were never assigned to the print publishers, have already reverted, or are revertable to the authors on demand. So why would the Internet Archive or librarians look exclusively to former print publishers, and not authors, for digital editions or rights to these works? It suggests that scanning a printed book to create a digital copy is a “transformative” use. Much of the pro-CDL FAQ is devoted to irrelevancies, such as whether the Internet Archive or libraries are making money from CDL. Making and giving away free copies undermines authors’ and publishers’ revenues and violates their copyrights, even if the infringer is a non-profit entity.